Egyptian Walking Onion. Order yours today and have onion seed for a lifetime. I promise to use it only to send you Provident Living Rewards. I first saw an Egyptian Walking Onion in my neighbor’s garden. He acquired his start back in the 1960’s, and it’s been propagating itself ever since. 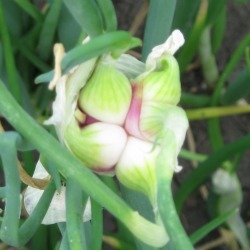 Clusters of sets grow at the top of each mature onion. I've never seen anything like it. New onion bulblets were growing on the plant. The sets vary in size (1/4" - 3/4" diameter). When you get your order, there will be some big sets and some small sets. We throw in a couple extra sets just for good measure. We are now taking pre-orders for next summer. They should be ready to ship by mid-summer. How Many Sets Do You Want? The Egyptian Walking Onions go by a few different names. Their scientific name is Allium Proliferum. They are very prolific and will grow year after year. When the bulblets or sets at the top of the plants get heavy, the stems bend to the ground, and the sets replant themselves. The onions do well in a garden where they don’t have to compete with the weeds. As long as they have weed free soil to expand their boundaries, they’ll keep walking all over your garden. This is why they are called Walking Onions. 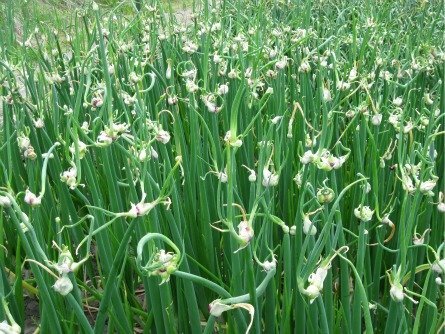 They are sometimes called Winter Onions because they very hardy and are rarely affected by the cold weather (zones 3-9). 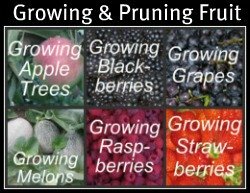 You can plant them spring, summer, or fall. They can even be planted in the winter if the ground isn’t frozen. They will winter over and come up first thing in the spring. Some of the other names that I’ve found for them are Top Setting Onions, Top Onions, Egyptian Tree Onions, or Tree Onions. Just looking at their picture lets you know how they got their names. They look like little trees with onions growing on top. Plant your onion sets, and it won’t be long until you see green leafstalks coming up through the ground. The Egyptian Walking Onions won’t produce topsets the first year. Be patient, once they start producing topsets, they’ll just keep getting bigger and stronger each year. We planted our sets July 2010, and they’re producing topsets this year, 2011. Remember that they plant themselves wherever they land, so you can’t go too wrong when planting them. Plant your sets about 1 inch deep. Just poke them into the loose soil so that they’re fully covered. 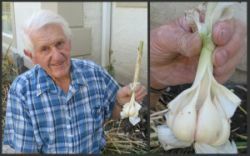 You can plant your onions in a cluster or row, whatever fits your garden spot. Plant each set about 3-6 inches apart in a row and space your rows 1-2 feet apart from each other. Unless you thin your onions, eventually this area of your garden will be covered with onions. Keep the soil moist, but not wet. They aren’t hard to control. If they’re growing where you don’t want them, pull them up and eat the whole plant. 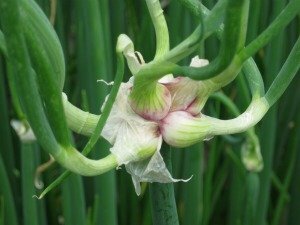 You can pull up the whole onion and eat it like you would a green bunching onion, or leave the roots in the ground, and just eat the green tops. If you leave the roots in the ground, new tender leafstalks will grow back. 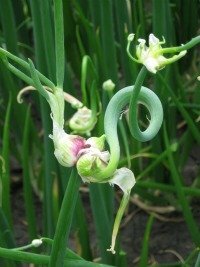 You’ll have fresh green onions from early spring to late fall. 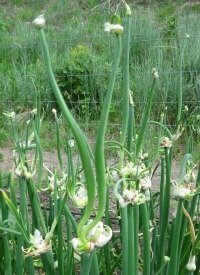 Egyptian Walking Onions are perennials. As long as you leave the roots in the ground they’ll come up year after year. 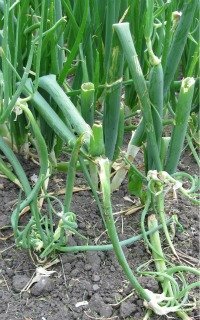 If you harvest the green leafstalks, you won’t get topsets from that onion plant that year. You'll get topsets if you don't harvest all of the leafstalks on the plant. 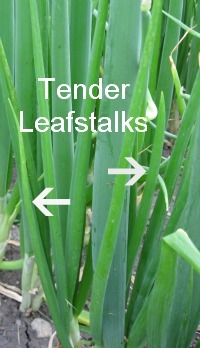 Harvest a couple tender green leafstalks from the each plant and leave the rest. Harvest the topsets in the fall when they are fully mature. Replant them or share some with fellow gardeners. If you want to harvest the full onion, replant some topsets in the Fall so that you have some for next year. Onions make food taste better. Enjoy! Our goal is your success. Tell us about your Egyptian walking onion experience. If you have a picture we'd love to see it. 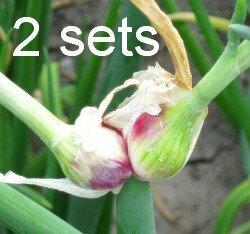 These are typically not a large-bulb onion, however like most onions, if planted singly the bulbs will get larger than if left in clusters. ©Copyright 2009-2013 Provident-Living-Today.com Do you like this website? Click on the Site-Build-It link to learn how you can build your own website.